Joanne Lin, legislative counsel with the American Civil Liberties Union, called Trump's revised order the "Muslim Ban 2.0." 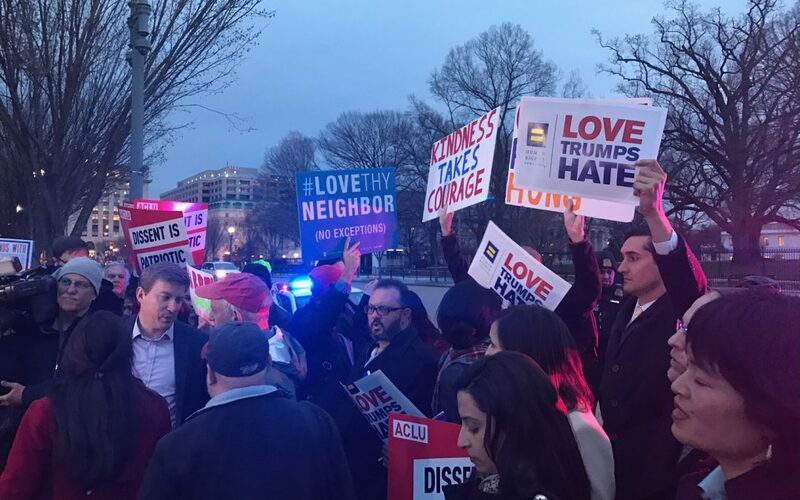 WASHINGTON – About 200 people rallied outside the White House Monday evening to protest President Donald Trump’s revised executive order that temporarily halts entry to the United States for citizens of six Muslim-majority nations calling it “Muslim ban 2.0” and an unconstitutional action. The executive order came earlier that day, an effort to address concerns over the previous ban’s constitutionality. While Iraq was removed from the original list of targeted nations and the new executive order clarified the status for those already holding green cards, organizers said there was no substantive change to the law. Speakers from various organizations, including progressive advocacy group MoveOn.org, LGBT rights group Lambda Legal and the Communication Workers of America union, gathered outside the gates to the White House, but U.S. Park Police forced the protest further away twice, citing security concerns. One of the protesters, Nicholas Bellomy, who called himself a loyal Republican when George W. Bush was president, said Trump’s campaign rhetoric and policies forced him to re-evaluate his positions. Mai Doherty traveled from McAllen, Texas with her husband and children to the protest because of her own childhood experience as a Vietnamese refugee. She was looking to do more to help. Despite anger over the revised ban, organizers asserted they will not let it go unchallenged. Tom Perez, the newly elected chair of the Democratic National Committee, assured the crown that his party would fight the executive order.